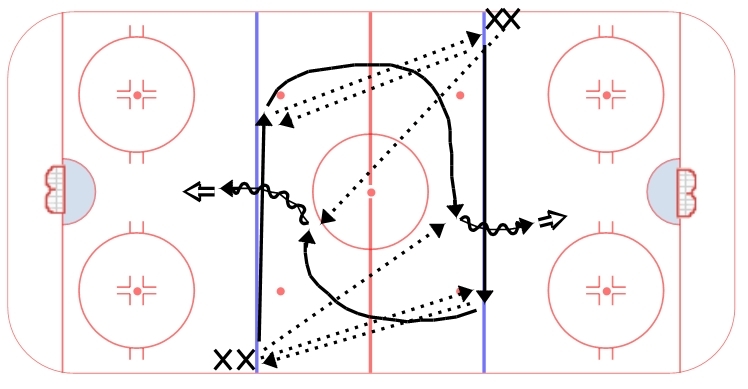 A simple but high paced warm up drill. X1 (green) and X2 (red) bump and exchange with F1. 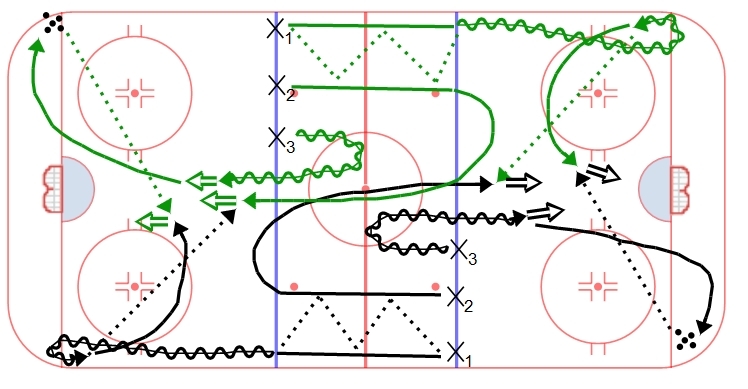 F1 then bumps the puck to F2 while X1 and X2 jump onside (always facing the puck – mohawk). X1 and X2 receive a pass from F2 and then attack the net 2v0 – look for a pass off the far pad with a hard net drive. F2 then jumps in line, F1 becomes F2 and whoever shot the puck becomes F1. There are three progressions to the drill. 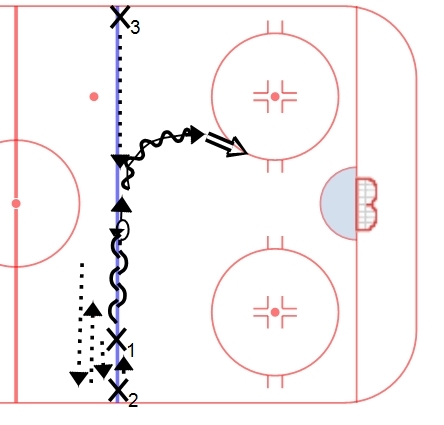 First – after bumping the puck to the attacking 2v0, F2 can then backcheck the two forwards. Put pressure on them from behind and attempt to breakup the play (you can designate F2 to backcheck the puck or the man, based on your backchecking system). The second progression is to have F1 gap up and play the two attackers in a 2v1 – if F1 is a forward then he/she angles the puck carrier, if F1 is a D then he/she should have a good stick and play it as they would a 2v1 rush. In this scenario, after each rep, F2 becomes F1 and a new player from the line fills the role of F2. 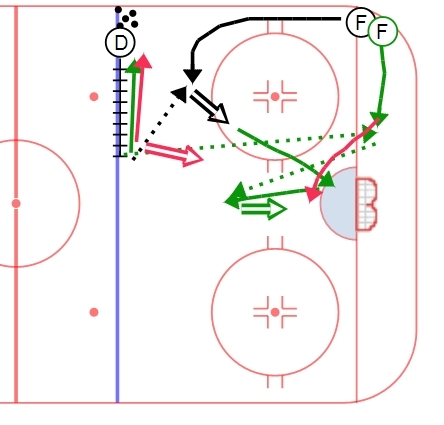 The third progression is to have F1 gap up and F2 backcheck, creating a tight area 2v2 situation – the defending players have to communicate, identify and sort it out quickly on the rush.